Less than half of the applications from UK firms for "trusted trader" status have been approved by HMRC since 2016, Newsnight has learned. The status is a quality marker, which the government says allows firms to fast-track their shipments through customs. This could be crucial if the UK leaves the EU without a deal. 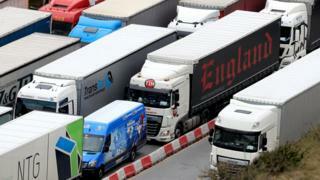 Hauliers say they have been given "chaotic information". HMRC said businesses must "meet strict compliance standards" for the status. Will Brexit happen on time? Between June 2016 and January of this year, 749 applications for the so-called Authorised Economic Operator (AEO) trading quality mark were submitted, according to data obtained by Newsnight. But only 365 authorisations were made in the same period. HMRC said these figures may include multiple applications for a single business. "HMRC work with businesses to help them correct any errors in their applications and provide guidance on actions they can take to meet the required standards," said a HMRC spokesman. Rod McKenzie, of the Road Haulage Association, said it's members had been given "chaotic, confusing and frankly incomplete" information. "It's just impossible to run a business without a clear system," he said. The status has been cited by Brexit supporters, including the former Brexit Secretary David Davis, as something could help to solve the problem of a hard border in Ireland or the Channel ports. But confusingly, the European Commission issued a notice on 30 January 2018 warning that in a no-deal Brexit, UK firms with the status would no longer be recognised by EU customs authorities, limiting its usefulness. However, some UK firms still believe AEO status - which is an EU-wide scheme - will benefit them in the event of the UK falling out of the EU with no agreement as early as 29 March. One of those is the Suffolk-based logistics firm Morrison Freight. Last year, its managing director Lee Steward said: "It involved a heavy financial investment, but we felt it was important and necessary and obtaining AEO status will certainly be a benefit to ourselves and our clients." Since February, the government has been pushing a UK-only no-deal customs facilitation scheme - instead of the AEO - called Transitional Simplified Procedures (TSP). "AEO status will only suit traders that regularly interact with customs and carry out high volumes of customs transactions. For most UK firms TSP will be the most practical system to import into the UK from the EU if we leave without a deal," said a HMRC spokesman. Up to 15 March 2019, there have been 7,980 TSP registrations. That's out of 145,000 VAT-registered UK businesses that trade with the EU, who have been written to by HMRC to encourage them to apply. There is growing concern among business lobby groups about the readiness of UK firms for the possibility of the customs checks that would follow a no-deal Brexit on 29 March. "Our concern is that trusted trader has been used as a bit of magic bullet by ministers and it has acted as a bit of a barrier in terms of having a sensible discussion about the practical difficulties that leaving the EU might bring," said Matt Griffith, of the Business West Chamber of Commerce. To apply for either AEO status or TSP status, trading firms first need to acquire an economic operator registration and identification (EORI) number from HMRC. HMRC said that as of 8 March there had been around 57,000 registrations for an EORI number, out of an estimated 240,000 firms that need one.